Columbus takes a 3-0 series lead against a team that tied the NHL record for regular-season wins. COLUMBUS, Ohio — The Columbus Blue Jackets extended their stunning postseason mastery of the Tampa Bay Lightning, beating the NHL’s best team 3-1 on Sunday night and moving to within a game of sweeping the first-round playoff series. Matt Duchene, Oliver Bjorkstrand and Cam Atkinson scored, and Sergei Bobrovsky fended off a desperate third-period charge to finish with 30 saves for the Blue Jackets, who took a 3-0 series lead. Columbus will try to win a playoff series for the first time in franchise history in Game 4 at home Tuesday night. The Blue Jackets have commanded the series since they fell behind 3-0 in the opening period of Game 1, only to rally for a 4-3 win. They pummeled the Lightning 5-1 in Game 2, and solidly outplayed them for all but a few minutes in Game 3. The Blue Jackets were 2-8 at home in three previous postseason appearances. They are the only NHL team that hasn’t won a playoff series. The Lightning are facing an unexpected quick elimination. 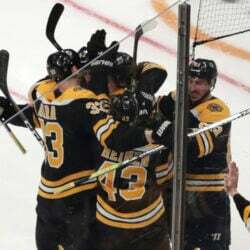 Teams have come back from a 3-0 deficit to win a playoff series four times, most recently in 2014, when the Los Angeles Kings dug out of the hole in the opening series against San Jose and eventually won the Stanley Cup. ISLANDERS 4, PENGUINS 1: Jordan Eberle scored for the third straight game, Robin Lehner stopped 25 shots and the Islanders rolled to a 4-1 victory over visiting Pittsburgh to take a 3-0 lead in their best-of-seven Eastern Conference quarterfinal series. Matt Murray finished with 32 saves for the Penguins, but Pittsburgh again struggled to generate any offensive momentum against the Islanders, who allowed an NHL-low 196 goals during the regular season. Pittsburgh’s Sidney Crosby and Jake Guentzel, who combined for 75 goals and 101 assists during the regular season, have yet to record a point in this series. JETS 6, BLUES 3: Kyle Connor scored twice, Patrik Laine had a goal and an assist, and Winnipeg won at St. Louis to climb back into the first-round playoff series. Winnipeg dropped the first two games at home by one goal, but got back on track in St. Louis. Kevin Hayes, Brandon Tanev and Dustin Byfuglien also scored, and Connor Hellebuyck made 25 saves. AVALANCHE: Cale Makar is about to jump from one grueling playoff run straight into another. The 20-year-old defenseman signed a three-year, entry-level deal with Colorado, a day after his UMass squad lost in the Frozen Four championship game. Makar, who’s from Calgary, could make his NHL debut Monday in Game 3 of a first-round playoff series against the Calgary Flames. The series is tied at a game apiece. The 6-foot, 192-pound Makar was the fourth overall pick by Colorado in the 2017 draft. He recently won the Hobey Baker Memorial Award as college hockey’s top player after a season in which he had 16 goals and 33 assists in 41 games.